Islamic Dominoes in the Arab Spring – Will Turkey be next? It looks like a crusading Republican president’s ultimate fantasy come true! Populist uprisings sweeping fundamentalist dictators from power throughout the Islamic world, bringing democracy to the oppressed and opening new markets for Coca Cola and Subway. Pity it had to happen while a Democrat was in the White House; and pity for the Democrats that it had to be their man who launched the next military strike on an asymmetrical foe. Nevertheless, when things at home are not looking so rosy, it’s a positive sign for the American Way that its greatest threat is seen to be succumbing to the rising power of democracy from within. The recent unrest kicked off in Tunisia back in December last year when a young man set himself on fire in protest at the repressive policies of Zine el Abidine ben Ali, president for the past 24 years. At first the military tried to suppress the resulting riots, but later changed tack and removed President ben Ali. It has been subsequently reported that huge quantities of jewellery and cash in various foreign currencies have been found in the former presidential palace. Protests in Algeria have so far been less successful, having been ‘quelled’ by riot police operating under the state of emergency which has, apparently, been in force since 1992! The country has been ruled for 11 years by President Abdelaziz Bouteflika, ‘elected’ in 1999 with the aid of the military and a fraudulent vote. Jordan was pretty much a British puppet until after the Second World War. Since then it has remained a fairly unconstitutional monarchy with a strong military financed by the US, the UK and France. Recent protests in February and March were forcibly dispersed, and protestors severely beaten, if we are to believe reports. Oman’s head of state is a hereditary sultan, currently Qaboos bin Said al Said, who has led the country since overthrowing his father in 1970 (interesting interpretation of ‘hereditary’). Ministers are appointed by the sultan. There have been popular protests this year, but recently they have been broken up with increasing violence. Yemen has been ruled by President Ali Abdullah Saleh for 32 years since he more or less assumed power after the assassination of the previous president, Ahmed bin Hussein al-Ghashmi. According to Wikipedia (quoting other sources), ‘almost half of the population of Yemen live on $2 or less a day, and one-third suffer from chronic hunger. Yemen ranks 146th in the Transparency International 2010 Corruption Perceptions Index, and 15th in the 2010 Failed States Index’. Protests have continued through February and March and pro-Saleh forces have been using increasing force to suppress them. Hosni Mubarak, essentially a dictator installed in 1981 after a military assassination of Anwar el Sadat, ruled Egypt for thirty years until obliged to resign after the armed forces decided to stop supporting him in the face of a popular uprising. According to a recent Time article, ‘US taxpayers [had been] spending $3.5 million a day on the Egyptian military, buying it everything from F-16 jets to M-1 tanks’ – helping to make it the world’s 10th largest military. Sometimes it’s hard to tell exactly whose side we’re on. Problems in Lebanon seem to come down to religion rather than popular unrest. Since the French moved out at the end of World War Two, the country has been governed by an interesting system of power-sharing among the Maronite Christians, Sunni and Shi’i Muslims. It’s not easy to understand exactly what’s going on in Lebanon these days except that the Shia militant Hezbollah group have been steadily gaining power, and are suspected of having had a hand in the assassination of the Western-backed Prime Minister, Rafik Hariri, in 2005. Kuwait is said to have the world’s fifth largest oil reserves, and to be its 11th richest country, on a per capita basis. It claims to be a constitutional monarchy, but the ‘constitution’ seems to consider the hereditary emir to have pretty much absolute power over his subjects. There have been street protests recently, but not much outside support is likely. You may remember George Bush Snr disinterestedly stepping in to rescue little old Kuwait from that big bully, Saddam, back in 1991. Lucky little Bahrain, with a total population of just over one million, has the good (or bad) fortune to be rich in oil and pearls. Since 1970, when the British moved out, it has been an absolute monarchy. The present King, Shaikh Hamad bin Isa Al Khalifa, has been on the throne for eleven years. Recent street protests demanding rights and freedoms have been ‘brutally’ put down. Again, we’re unlikely to see much Western assistance for the down-trodden masses, given that the incumbent monarch very kindly allows the United States Fifth Fleet to operate from his nation’s waters. Well, Libya, of course, is another matter. 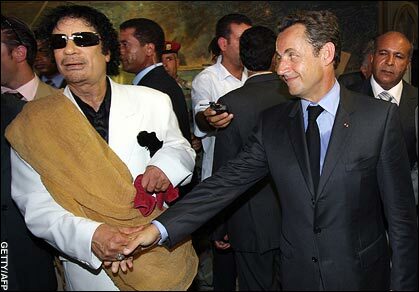 Muammar Gaddafi has been president since leading a military coup in 1969 to oust the monarch, King Idris. You wouldn’t expect to find him on any Western leader’s list of people to invite to his/her birthday party. President Reagan sent in the US Air Force in 1986, in an unsuccessful attempt to take Gaddafi out. Twenty-five years later, we have a similar scenario, though the US have been hanging back a little and allowing the French to lead the way with their Mirages. Libya, incidentally, has the world’s 10th largest proven oil reserves. Interestingly, France and Italy (another participant in the bombing) are its two biggest customers. Morocco is another ‘constitutional’ monarchy whose king, Mohammed VI has wielded fairly all-encompassing powers since ascending the throne in 1956. Parliamentary elections are periodically held, but clearly the public don’t feel very represented. Recent protests have been snuffed out by firm police action. Clearly, you are less likely to be held internationally accountable for such activities if you have the world’s largest oil reserves. One might be more likely to accept President Obama’s concern for human welfare in Libya if his government hadn’t recently agreed to sell $60 billion worth of high tech weaponry to the Saudis – the largest arms deal in history. Interestingly, 23% of Saudi Arabia’s population consists of foreign nationals, yet no one seems to be advising or assisting them to leave. So what do you get from all that? I’m not sure that I want to draw any sweeping conclusions, except to note that, as I suggested above, the situation is deeply complicated. It is probably safe to say, however, that support for the rise of democracy and the recognition of human rights in the Islamic world are not the major priorities of governments in the United States and the European Union. ‘But what about Turkey?’ I have been asked. ‘Aren’t you worried that this revolutionary fervour may spread in that direction?’ Well, frankly, I’m not, and I’d like to tell you why. Let’s begin with the nature of government in Turkey in comparison with those countries listed above. The modern Republic of Turkey was born in 1923 from the ashes of the Ottoman Empire. The last hereditary Ottoman sultan had, the previous year, seen the writing on the wall and allowed himself to be whisked away to safety on a British battleship, HMS Malaya. At that time, Istanbul had been occupied by the British and their Allies since the end of the First World War, and Sultan Mehmet VI Vahdettin had become their puppet. 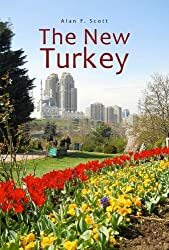 Turkey was not yet a democracy, but it had definitely asserted its independence, in the face of Allied attempts to subdue and dismember it – and the monarchy had become a relic of the past. The first true multiparty election was held in Turkey in 1950. It seemed to pass largely unheralded, as far as I am aware, but 2010 marked the 60th anniversary of that moderately significant event. Why it went uncelebrated is open to conjecture. I can think of two possible reasons. The first is that Turks were probably reluctant to accept that the father of their Republic, Mustafa Kemal Atatürk, had ruled as head of state for 15 years without troubling himself to hold an election. The second reason may be that, in 1960, 1971 and 1980, the Turkish military intervened in civilian politics and ousted elected governments, so the 60-year period has not been without its hiccups. Nevertheless, those periods of military government were brief, and the reins of power were quickly passed back into elected civilian hands. Sixty years is quite a significant time span, in global terms, as is the 87 years that have elapsed since the founding of the republic. France is currently into its fifth republic, and had hosted one revolution, two empires, one restoration of the monarchy and the establishment of an alternative monarchy within its first 60 years. The United States republic was still enslaving a large portion of its population eighty years after its foundation, fought a vicious and bloody civil war after ninety years, and was still committing ethnic cleansing on its indigenous peoples after a hundred. When considering the state of democracy in Turkey, it tends to be forgotten that several important members of the European Union have worse records. Spain, for example, was ruled by a military dictatorship for most of the years from 1923 to 1975, and did not become a democracy until 1978. Portugal managed the feat two years earlier in 1976, after a left-wing military coup in 1974 had ousted the right-wing dictatorship that had been trying to maintain the anachronistic colonial empire. Greece’s seven-year military dictatorship collapsed in 1974, interestingly, in the face of a threat of war with Turkey. The junta strongman, Brigadier Ioannides had sponsored the military coup in Cyprus that led to Turkish intervention on the island, and his supporters deserted him as a result. So it could be argued that Greeks should thank Turkey for the re-establishment of democracy in the land which claims it as its home. Of course, mature democracies understandably view military coups as undesirable, and inconsistent with the ideal of government of, by and for the people. Clearly it didn’t do Turkey’s claims for international recognition much good to have three such events in the space of twenty years. What those mature democracies may fail to understand is that (paradox though it may seem) the military in Turkey was constitutionally entrusted with the responsibility of maintaining democracy. The threat of militant Islam is very real in this part of the world, and fear of it, very deep-seated in the hearts of secular republicans. The present government in Turkey has been gradually working to curb the power of the military to interfere in political affairs – and has come under a deal of criticism for so doing. Another positive development in recent years has been the phenomenon known in Turkish as ‘açılım’, or ‘opening-up’. Turkey has long been criticised by Europe for human rights abuses, mistreatment of minorities, and curbing the freedom of the press and the right to protest. Few would argue that Scandinavian levels of personal freedom have been attained – but at least the ‘opening-up’ has allowed discussion to begin on issues such as the Kurdish situation and relations with Armenians. The Turkish film industry has flourished in the past fifteen years and formerly taboo subjects such as the on-going war in the east, the treatment of villagers, and civil rights abuses under the military regimes, have begun to reach the mass market. In the end, of course, there’s nothing like money to stop people complaining about their lot in life – and clearly much of the unhappiness in those North African and Middle Eastern states is related to perceived disparities in wealth and opportunity. Certainly, Turkey is no paradigm for egalitarian wealth distribution, but average incomes are on the rise, and there is a rapidly growing middle class with real discretionary purchasing power. Per capita GDP increased by 34% in the first decade of this century, while inflation fell from an astronomical and chronic 70% to an acceptable 7%. The process of urbanisation is continuing, and this, combined with rapid population growth, has, of course, created problems. Both rates are now decreasing, however, and this should lead to greater stability and rising standards of living across the board. Ironically, it may be said that one of Turkey’s blessings is a lack of indigenous fossil fuel resources. If a generalisation can be drawn from its neighbours in the region, oil riches can bring disadvantages. Too much wealth can attract unwelcome attention from outsiders, and have a negative affect on the character of its possessors. Despite its lack of oil, Turkey has a larger and more healthily diverse economy than any of its Muslim brother states. Lists compiled by the IMF, the World Bank and the CIA give it a global ranking of 17th, ahead of Indonesia (with four times the population) and the oil-rich Saudis. Undoubtedly there will be those who say I am painting an unduly rosy picture of a state that still has some way to go to reach the living standards and personal freedoms of the best of the Western nations. There are social and economic injustices in Turkey, and a crying need for more equitable access to education. Turkey has the misfortune to be emerging from its sometimes murky past at a time when Western nations themselves are struggling to maintain the living standards, freedoms and equality they may once have taken for granted. Nevertheless, these days you are less likely to hear Turkey ranked with the Islamic states of the world, and more likely to hear it mentioned in the same sentence as China, India and Brazil. This entry was posted in Arab Spring, Atatürk MK, Turkish economy, USA. Bookmark the permalink. ← New Zealand and Turkey – What’s the Connection?